It's almost time to return to Gilead, and with that comes returning to the Waterford residence and all the horrors kept within. 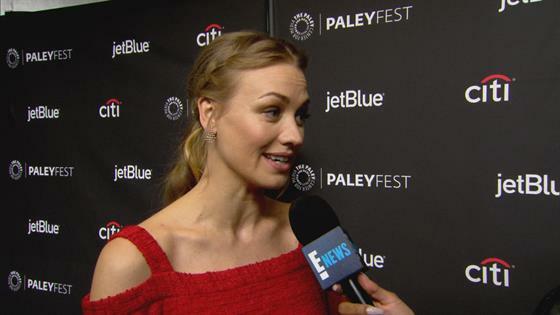 For star Yvonne Strahovski, who plays Commander Waterford's (Joseph Fiennes) icy and barren wife, that means returning to Serena Joy's specific brand of cruelty. And as the actress told E! News' Sibley Scoles, this season's behavior had her question her character's choices more than ever before. "I mean, I've had a love-hate relationship with Serena from the get-go. It's been real push and pull with her, especially this season even more so because I think the relationships are so much more heightened," she admitted. "And there's so much more complication to each of the relationships that Serena pulls some moves that I'm even more trying to figure out why. Why are you so mean? It's very confronting." With Offred (Elisabeth Moss) finally pregnant thanks to Serena Joy's maneuverings and Nick's (Max Minghella), err, sperm donation, the stakes are much, much higher for the Waterfords. Especially because in the final moments of season one, Offred was put into a van with no explanation of where she was being taken or why. "The stakes are high in Gilead as it is, which is what we sort of set up in the first season, you know? Every little twitch, every breath was something, meant something," Strahovski said. "We're jumping right off of that into a whole other level of tense." And it's through that tension that Serena Joy makes some decisions that the actress admitted she had a hard time reconciling. "We put a lot of thought into what we do. Certainly, I spend a lot of time discussing certain scenes with people if they seem to be a little especially tricky. And I have found that towards the second half of the season, you'll see eventually, there are certain things that happen that are kind of difficult to justify in a lot of ways," she teased. "So it really is about diving deep into the relationships and understanding them so intricately and understanding why someone could do something like what you're going to see down the line." Despite being mired in the misery of Gilead day in and day out as they film, Strahovski admitted that the cast has found ways to keep things light when cameras aren't rolling. And one involves a certain reality TV show that we're pretty obsessed with ourselves around these parts. "I will tell you there is a lot of discussion of the current season—or what just passed—[of] The Bachelor. We have viewing parties. There's a little group of us, a lot of us are into it. You'd be surprised. We even got Joseph Fiennes to watch an episode. And he's going to kill me for saying that, so I really shouldn't have let that out of my mouth!" The Handmaid's Tale returns for season two on Wednesday, April 25 on Hulu.